Toby Keith‘s new album Hope on the Rocks hits stores next Tuesday, Oct. 30, and he’s giving fans the chance to hear the entire album right now as well as win some exciting prizes. 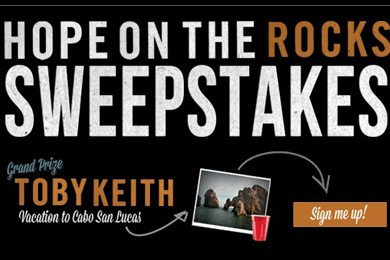 Fans can visit www.tobykeith.com/hopeontherockssweeps/ and sign up to hear the entire deluxe version of the album and enter the sweepstakes through Friday, Oct. 26. Weekly prizes have been awarded throughout the month, including custom corn hole game boards, branded guitars, red Solo cup plaque, and tour tickets, all of which are leading up to the Grand Prize Mexican vacation to Cabo San Lucas. Pre-order Hope on the Rocks here.